Step 1. To make small paper cones from baking paper, cut a 13cm diameter circle of baking paper, then make a cut from the edge straight into the centre. Wrap and roll the paper around fingers to make a cone with a 3cm diameter opening, and secure with sticky tape. Place point down in a shot glass, espresso cup or upturned egg carton to support. Repeat, making a total of 20 cones. Step 2. Combine the white chocolate and butter in a bowl over gently simmering water and melt, stirring occasionally. Remove from heat and stir in the coconut, pistachios and cherries. 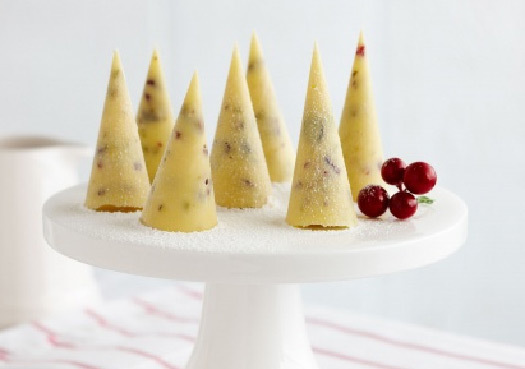 Spoon into paper cones and allow to partially set at room temperature before refrigerating.